So with this update, what do I plan on doing with my Travel Packages? I redeemed a total of 810,000 Marriott points for 240,000 Alaska Airlines miles plus 14 nights worth of hotel stays. If I wanted to, I could get a total of 360,000 points refunded. That’s because I’d get 165,000 points refunded for my Category 9 certificate, and 195,000 points refunded for my Tier 1-3 certificate. That means I would have in the end paid 450,000 Marriott points (the equivalent of 150,000 Starpoints) for 240,000 Alaska miles. That’s 1.6 Alaska miles per Starpoint, and that’s a value I’m really happy with. Option #2: what’s the real cost of staying 14 nights? The above is the opportunity cost of redeeming the certificates for two stays. If I were to actually use these certificates I’d receive a 30,000 point refund on the Tier 1-3 certificate, meaning I’d be paying a total of 165,000 points per seven night stay, and those Category 9 certificates can be redeemed at new Category 6 hotels. Okay, a seven night hotel stay sounds nice, though in reality I typically only really like to stay in one place for 4-5 nights, and Marriott offers a fifth night free on award redemptions. So I should apply some real discount to that stay, since it’s not something I’d typically do. 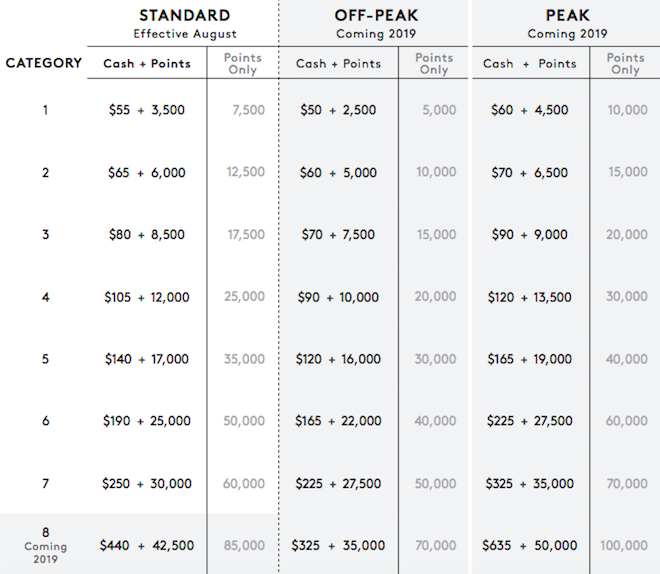 For the remainder of the year, a Category 6 hotel would cost 50,000 points per night, meaning a five night stay would cost me 200,000 points. In other words, if I could find a Category 6 hotel that I wanted to spend five nights at, I’d otherwise spend 200,000, so I’d still come out ahead with my Travel Package certificate. Based on how I value things, redeeming the certificates would be worthwhile if I could find a Category 6 property that I actually wanted to spend five nights at. Certainly many of those properties exist, though the added wrinkle is that this year I will be really focused on redeeming at Category 7 properties, since Marriott’s top hotels will be bookable at that rate due to Category 8 hotels not being introduced until next year. So for me the Travel Packages math goes beyond whether I can find a Category 6 hotel I want to stay at, but also takes into consideration that I’d prefer to redeem at a Category 7 property, while Category 8 is still priced that inexpensively. If you can’t decide what to do, the good news is that you have until the certificate expires to decide whether or not you want to refund it. I’m very fortunate to have a big balance of Marriott points, and I don’t need the points that I have held up in these certificates. So I think my plan is to wait for now and see what my travel plans look like. If I end up making a stay in the next year a Category 6 property where redeeming points is a good value, I’ll use the certificate. If I don’t, I’ll just take the partial refund, and view it as a great deal on Alaska miles. What’s your strategy in light of Marriott’s modified Travel Packages policy?